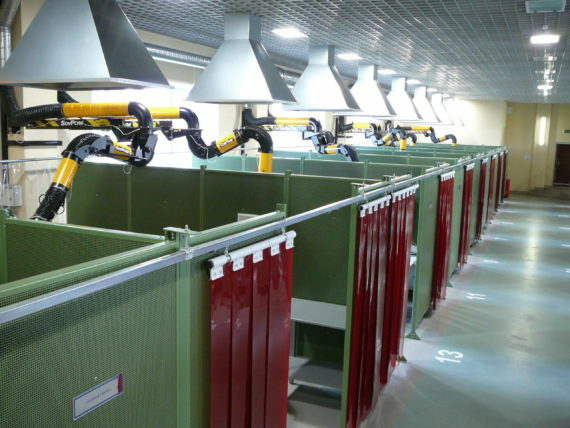 Any metalwork applications produce a lot of noise that at a certain level becomes hazardous and can cause serious damage to the health and productivity of employees. Noise is not only dangerous for worker who is doing the noisy operation but as well for other employees nearby. Light emissions are another serious threat to the employees’ health. Prolonged exposure to welding light or other bright light sources can cause severe damage to the naked eye. Do not take any compromises – SovPlym workplace solutions protect both operators and employees from noise and light emissions also preventing dust and pollutants from spreading around premises. Workplace solution provided by SovPlym include modern and highly efficient downdraft tables with big number of options and extraction panels suitable for big open workplaces. 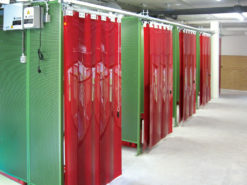 Modular noise reduction cabins and flexible curtains allow to divide different production areas, make them clearly organized and reduce the pollution areas. 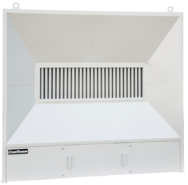 Professional downdraft table for welding dust and fumes. Equipped with protection screens and adjustable legs. 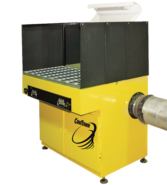 Advanced downdraft table for welding and grinding with two extraction panels. Comes with two protection screens and adjustable legs. 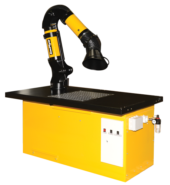 Basic welding downdraft table with the filtration system. Built-in extraction fan. 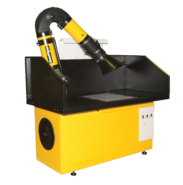 Equipped with flexible extraction arm.